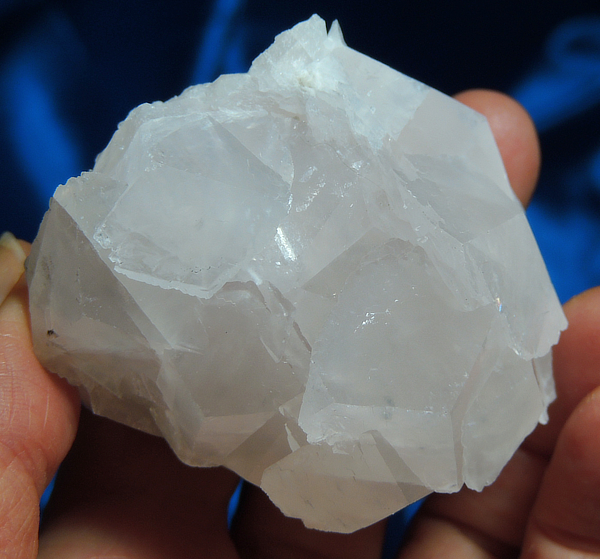 This is a palm-sized and wondrous 5.6 oz cluster of ethereal, almost moonglow manganocalcite measuring 2.4” by 1.8” by 1.9”. The many crystals are stacked layers (rather like cookies or petals), a natural crystalline state for calcite and manganocalcite and the effect is truly lovely. She is a soft but rich pink and for a special treat, put her under a black light (ultraviolet) and her manganocalcite turns a HOT pink! Plus there is just a bit of pyrite on one side and a circle of it at her base core. She has an unassuming look when you first gaze on her that belies the intense energy and immense crystalline energy she exhibits! Plus, she is a gorgeous addition to your special love altars. She is part of a shipment of wonderful crystals from Kosovo and I have to admit to being both fascinated and blown away by the diversity and the energy! Calcite and manganocalcite are similar in energies, but manganocalcite is more intense and in her accelerates the change aspects, but in a very refined and focused way … but gently and soothingly. She energizes you for the transition so that not only do you look forward to it, but you embrace it with every fiber of your being. It as a critical step and is symbolic of the process we go through in setting up a communication with our Higher Self. It begins with the physical, often with a profound healing challenge such as a serious illness or accident. In the healing process, we learn that we are more than our physical Self and begin to expand our mind in order to facilitate the healing. As we grow in our abilities, our Higher Self gains a larger voice and activates much more easily. This is the Self that guides and nurtures – that teaches us to trust those ‘voices’” inside that some call ‘gut feeling’ or intuition. This Spirit teaches us to truly feel with our heart and speak with the truth of the Soul!